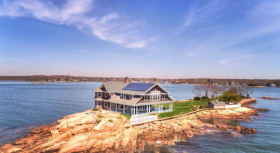 Own your very own private island that feels like it’s a million miles away, or at least off the coast of Maine, but is actually off the shore of Connecticut for only $4.9 million (h/t Mansion Global). With the not-at-all charming name of Potato Island, named for a group of potato-looking boulders near the shore (you say potato, we say po-tentially change that name! 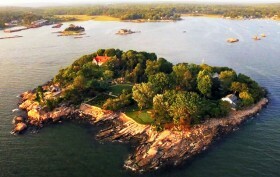 ), this private island is part of the Thimble Islands, an archipelago of small islands, 23 of which are inhabitable, in the Long Island Sound in and around the harbor of Stony Creek in the southeast corner of Branford, Connecticut. Hey, big spender…before you close on that trophy penthouse condo or townhouse duo, take a look at this extraordinary listing. When you’ve got billions–or even lots of millions–your real estate options are many. From a penthouse in the sky in a Billionaire’s Row skyscraper to a townhouse or two on the Upper East Side or a Hamptons manse with acres of beachfront property, modern-day palaces await. For that eight-figure outlay, this listing is unusual even among the real estate deals of the superrich. The Post tells us of a private archipelago off the Connecticut coastline, owned by Christine and Edmund Stoecklein, on the market for $78 million. Known as the Thimble Islands, this surprising collection of eight islands boasts beautiful restored 19th century mansions, pools, guest houses, docking for yachts both small and large, a commercial-level greenhouse facility, tennis courts and a golf putting green and tees designed by Jack Nicklaus. The property is at most a ten-minute boat ride from the Connecticut shoreline or a twenty minute helicopter jaunt from Manhattan.